Ultoo is a fast growing and very popular free sms site in India which allows you to send sms to any mobile number in India from your account at ultoo and Get free mobile recharge for it and various other things .In this post we will review Ultoo & Also tell how to get free mobile recharge using ultoo. 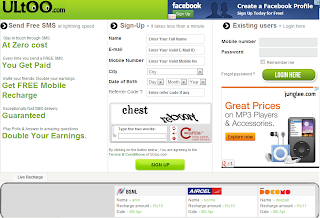 1) Send free sms to any mobile number in India and Earn 2 paisa for every free sms sent. 2) Answer Poll questions and Earn 1 Paisa for every poll question and 10 paisa for submitting your poll question at the end of the poll. 3) Use “Answer it” Option and Answer the Questions and Earn 2 Paisa for every question you answer. 4) Invite your friends and ultoo and Earn Rs.1/- per friends who successfully joins ultoo as your referral. The Ultoo team is adding various features and you can even use them to get more recharge. Once you have accumulated minimum of Rs.10, You can recharge your mobile online through your account at ultoo. You just need to give mobile number, network details etc and your recharge will be done instantly. Ultoo is a very good site to send free sms and save some money. The SMS are almost delivered instantly to the receiver.They also pay you for sending free sms, so simultaneously you can accumulate some earnings and get free recharge for your mobile. Many of my friends and even myself have got free mobile recharge from Ultoo. So the site is genuine and trusted and Is a must try website If you are looking for a site to get free mobile recharge in India. You can register on Ultoo from here. If you like this post, kindly share it on social networks. Also your comments are welcome in comment box below.